If you're like me, you don't need much out of life. A good movie, a pretty girl, and a massive swarm of cyborg insects that you can command to bring a swift end to your enemies. Well, if this Kickstarter project has its way, we'll have the third one in no time. Meet the RoboRoach. This little kit allows you to mind control a living cockroach. Well, perhaps "mind control" is a bit of a stretch, as cockroaches don't exactly have "minds" in the same way we do. They are, however, aware of simple concepts like "I am near a wall." 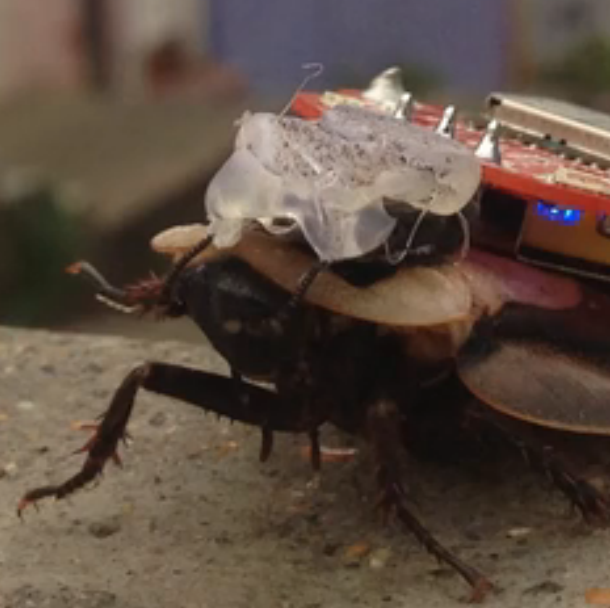 The way this Cockroach Cerebro works is it sends an electrical impulse to the insect's feelers to trick it into thinking that it's next to an object that it wants to get away from. So, it's a little less like a Chitauri scepter, and more like when a crappy 3D movie flings ping pong balls at your head. Your tiny, crunchy head. At the time of writing, the project has received $1,325 of its $10,000 goal. If you want to get your own personal plague, each individual kit costs $100 (though they indicate the price may go down after they get funded and get through a few more development rounds). Also, bugs aren't included. However, the New World Order is essentially up to the highest bidder. For less than a new car, you can have an Android-powered swarm of insects the like of which the world hasn't seen since Moses.